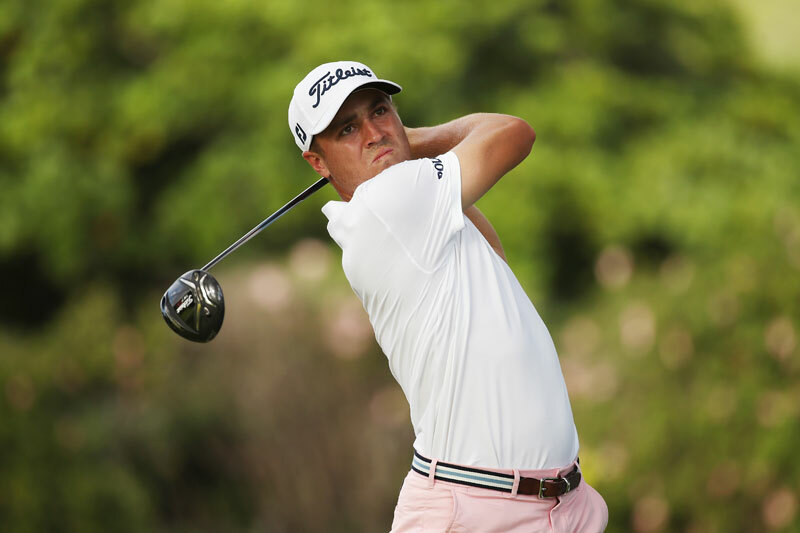 PGA Tour golfer Justin Thomas had himself a breakout year in 2017. The Kentucky native stormed his way through the competition—winning four PGA Tour events, including his first-career major at the PGA Championship. Thomas capped things off by winning the FedExCup championship, taking home the $10 million bonus while beating out his friend and three-time major champion Jordan Spieth in the season-long standings race. For all his accomplishments Thomas was named the PGA Tour Player of the Year. On top of that, he finished the season as the leading money-winner on the tour, besting stars like Dustin Johnson, Rory McIlroy, and Spieth. What led to this step up to the elite level for Thomas? A renewed focus on his fitness, training, and weightlifting, including pushing more on his core strength, balance, mobility, and injury prevention. The added muscle helped Thomas increase his club speed—two years ago he was around 115mph, and now, when he goes “after one,” Thomas can get up to 120-121mph—and the added strength has given him more confidence on the course. After a breakout 2017, Thomas is planning to keep it going in 2018. Thomas spoke with Men’s Fitness about why mobility training is so important, his favorite lifts, why legs day is essential, and what it means to win his first major title. MEN’s FITNESS: How did your training program help you to have such a successful 2017 season? What was the experience like winning your first major? Justin Thomas: We did a lot of work on my core, which is so important in golf. Your joints and your body need to move properly. Your hips have to be flexible, they have to be mobile, and that relates to your back and the rest of your body. If all that feels good, you really feel great on the course. Working on balance and core has been essential. I really felt like I learned from some of my past experiences, and I was able to stay calm and handle them better than in the past. My caddy did a great job of keeping us calm and keeping us in the moment, but, at the end of the day, I had a lot of confidence when I got in those moments. I was excited and I loved the opportunity to win a major golf tournament. Last year was very special. What’s your workout routine like during a tournament week and during the off-season? I’ll try to go and train Monday, Tuesday, take Wednesday off, then go Thursday, take Friday off, then either go maybe Saturday or Sunday. Sometimes, one of the days I’ll go in for some cupping or some needling work, just to make sure everything is loose. During a tournament week, I usually will do an hour workout. Usually 10 minutes of stretching beforehand, and then about a 40- or 45-minute workout, then anywhere from 5 to 10 minutes of stretching again at the end, just to loosen everything up and get rid of any soreness. During the tournament weeks, I’ll probably legitimately work out maybe two or three times during the week. We’re doing so much out on the course, walking a lot, and it’s a five-hour round, so you don’t want to drain yourself during those days. Some guys are different obviously, but for me it works out well, and it’s necessary to where I can just get some workouts in the beginning of the week, and then maybe throw one in as the tournament starts. But for the most part, I’m just getting treatment done all week. With the PGA Tour season going almost year-round, what are some of the ways you train to help with your stamina, endurance, and injury-prevention during a long season? It’s really just making sure that you’re being functional and you’re not overdoing it in your training. I think that’s very important. It’s crazy how fitness plays such a huge role in college teams now and even high school teams to where when when younger guys are getting out here on tour, they’re already ready and it’s a part of their lifestyle. You don’t want to overdo it in terms of practicing or working out, because the legs need to feel fresh and your mind needs to be right through the season. If you don’t make the right decisions when your body and everything is fatigued, it can start to build up. I really feel like I started to learn how to handle things this past year, and it’s helped me a lot. I’ll have a lot shorter practice sessions now; I guess, quality over quantity. One big thing is just staying hydrated, and you also have to make sure you’re eating enough. Any energy lost is mental as well. You don’t want to make mistakes out there. You won’t be making the same decisions that you would be when you’re fresh and you’re ready. What are some of the ways your work on your mobility, flexibility in your training? I’ve been doing a lot of split-stance stuff. Loading things into your hip to make sure that your hips are firing and your glutes are firing, because if they don’t that kind of misaligns everything else. We’ll do a ton of lunges, or we’ll do anti-rotation stuff or bands, pulling and pushing or overhead stuff. We do a lot of curls or an overhead press, and we’ll do some on one leg just to work on balance. We very rarely will do something that’s only working one aspect. When you’re split stance and you have a band and you’re trying to pull it the other way, anti-resistance, then you’re working on your core; you’re working on your hips and your glutes and you’re working on your upper body just by twisting everything. It’s really just all making sure that your body is feeling good out there. What’s one area of training or a workout that’s helped you get your body where you feel most confident on the course? I would say stuff with my back and with my scaps. That’s a part of my body that’s probably weaker than some of the other parts. I just would have injuries that would randomly come up. We’ll do a lot of rowing stuff, or a one-legged band press or the I, Y, and Ts with bands. Just anything to strengthen that part of my body to where I don’t have those injuries, and to where I don’t feel like I’m flinching at the ball when I’m at impact. That’s obviously no good. That’s been a big, big addition, and really helped me last year. With golfers being on their feet so much, what are some ways you work on building your power and your lower body in your training? We do a lot on the Bosu ball. That really helps with my stability and ankle mobility. We’ll do a lot of leg raises and one-leg moves to work on balance. That’s all going to help your ankles and your calves and those areas. We also use squats and stuff like that; those are definitely an important part in the base of your golf swing, and a good way to build your foundation and power from the ground up. What’s some advice for the everyday golfers out there who want to add a few yards to their swing or get some extra confidence on the course? The biggest thing, and nobody is going to want to hear this, but for a regular amateur, honestly doing yoga or something like that could be way more beneficial than going and lifting weights. You could have as big an upper body as you want, but if your hips are tight and your hamstrings are tight and you don’t have a good core, you’re not going to be able to use that strength well. If you’re able to have the upper-body turn that I have at the top of my swing and be able to use your legs and the ground as well as I do, then that’s where you’re going to get your strength and power. That’s how people with small frames hit it as far as they do. Look at guys like Rickie Fowler—Rickie is stronger than I am, and he’s a tiny guy, but he’s very flexible and he’s very mobile, and that’s how we both get the most out of what we have. We’ve been a bit inconsistent this year, so I’ve been nervous this year, but I think we can win it all. If the defense continues to play the way they have this year, I think we’ll be just fine against Georgia and bring another national title home. Update: Turns out Thomas was right: Alabama won over Georgia in a thrilling overtime game 26-23 to win the national championship.